You might remember that peaches claimed the number one spot on my "favorite summer produce" list. But I must say, it was a close, close race. In fact, Brian and I agreed that the attributes we loved most about both peaches and tomatoes were mostly the same. Both taste infinitely better during their season than at any other point in the year. The personal acquisition of each (peaches from the orchard, tomatoes from our garden) guarantees a freshness and minimization of the bruises that these fragile fruits usually have when gathered from the grocery store, not to mention warm + fuzzy memories of time spent with your honey. And finally, both peaches and tomatoes are so very summer. In the end, I think it was my sweet tooth and Brian's lack thereof that determined each of our favorites. The ripening of tomatoes in our garden is a bittersweet time for me. Sweet, because we look forward to the juicy yellow, orange and red fruits from the time we plant the seedlings in mid-May, and bitter because it signals the beginning of the end - the downward slide of summer into fall. Especially this year, when our harvest season has been cut so short by the blight claiming tomatoes across the Northeast. Brian and I noticed it early this year, the slow yellowing then browning and shriveling of the lowest branches on our plants. Eventually, the plants become skeletons of their former selves, with sad tomatoes hanging desperately to branches for as long as they can. We learned this year that there is no way to avoid the fungus, especially since we have a strict no-spray rule, and if we want a full harvest season next year we need to plant a succession of tomatoes every 4 weeks starting in May and ending in July. Lesson learned. Despite the blight, we have had way too many tomatoes to handle all at once, just not enough for all of the canned sauces and salsas we had planned. 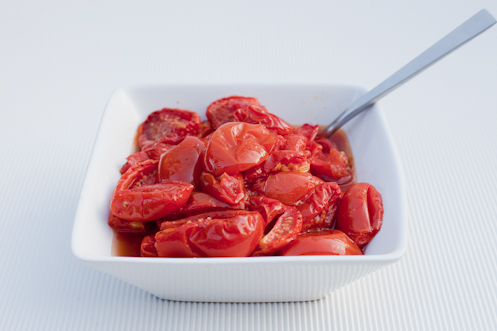 We've had countless tomato mozzarella salads, tomato + hummus + ham sandwiches, roasted tomato pastas and just plain tomato slices sprinkled with salt and eaten while standing over the kitchen sink, juice dripping from our hands. Friends and neighbors have been lucky recipients of our extras - and in fact our guests last weekend claimed our house as the best "bed and breakfast" they'd stayed at as they loaded their car with a bag of heirloom tomatoes and a jar of homemade jam. 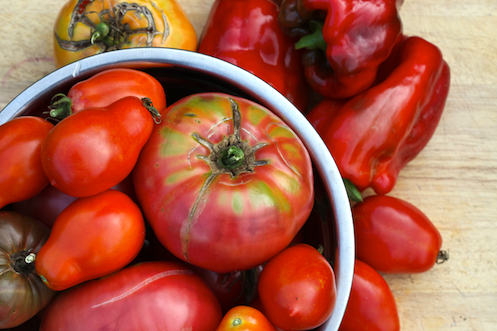 In return, they shared a recipe for Heirloom Tomato Soup that was not only delicious, but a great way to use up large quantities of our bounty. We made it the next night, and I was pleased after my first taste to find that it was reminiscent of a favorite tomato basil soup I enjoyed at a local Greek restaurant while in graduate school - rich and creamy, with a nice spice that hits the back of your throat after each bite. It was wonderful with fresh heirloom tomatoes from the garden, but I also look forward to trying it with canned tomatoes in the winter when I need a little reminder of warmer days. 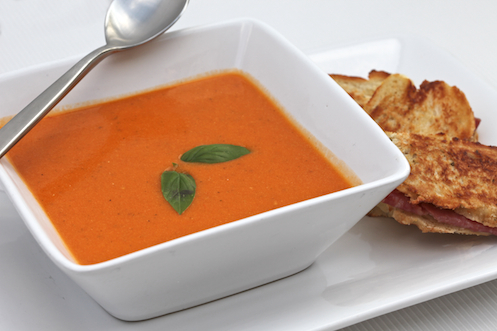 For me, tomato soup has no particular season - I'll take it any time of the year. 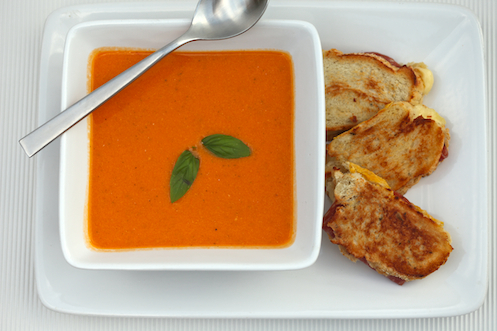 This soup is the grown-up version of a childhood favorite, and pairs perfectly with grown-up grilled cheese sandwiches. We made ours with a fresh french baguette, jarslberg cheese and salty soprassata - but feel free to use whatever soft cheese and cured meat makes you happiest. And, the Bella Eats Jam winner is...JENNY (comment #7)! Send me an email at bellaeats[at]gmail[dot]com and I'll get your jam out to you this week. If I don't hear from Jenny, I'll select another winner randomly in my next post.